Defenders (in blue) must stay on line between cones. Attackers try to get past all three defenders without having the pinnie (tucked into their shorts on one hip) pulled out. If defender catches pinnie, the attacker goes back to the start. Second attacker can begin once first attacker beats the first defender, or gets caught. Swap defenders every minute. 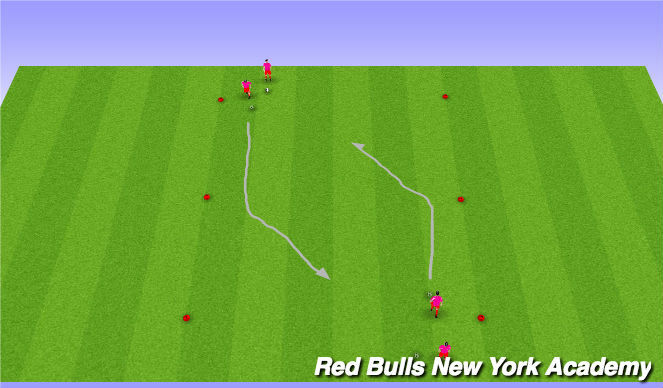 - First player dribbles ball to first cone on and perfoms a &apos;Ronaldo Chop&apos; and then drives to opposite cone on endline. Player on endline repeats and the process continues. Coach begins game with a pass to either team. 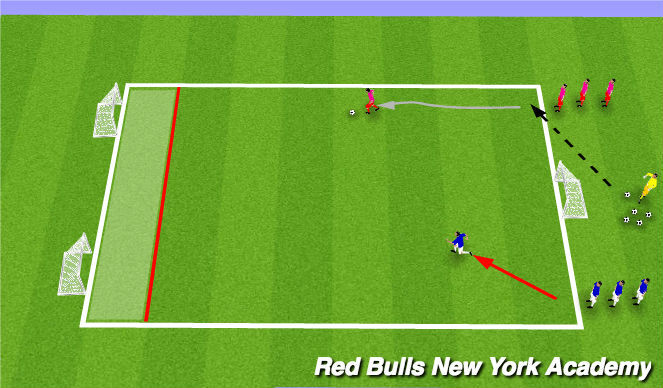 Receiving player scores by finishing into eiher goal (must be in the scoring zone before they can shoot). Defender is looking to steal ball and score in the counter goal.